Full Readings are normally $25. We also do full readings by phone, Facetime or Skype if you are at a distance. They really do work that way too!! Call 623-694-2910 if you have a question or need help making a decision. 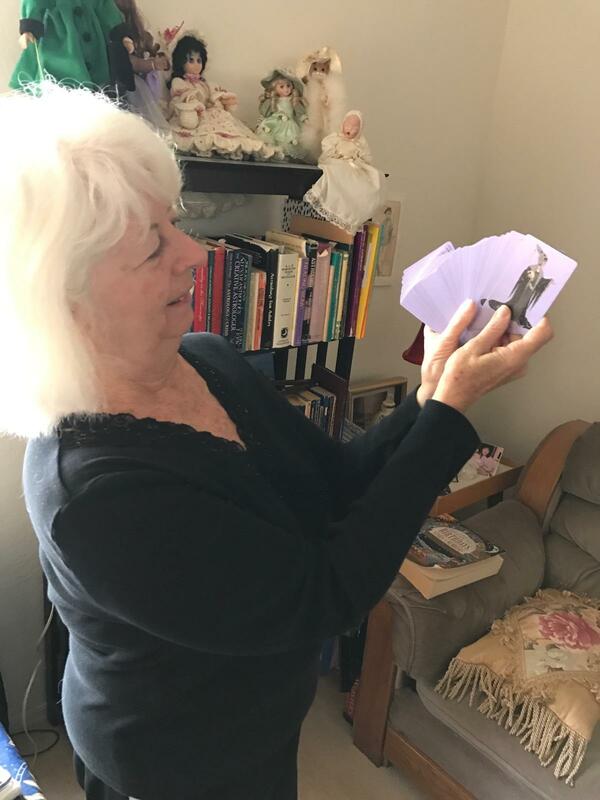 See us at: “Fun Out of the Sun” … Our Hearts Craft and Vendor Fairs in Sun City West in Arizona where I will be doing mini Tarot Card Readings for just $10. June 23, July 21, August 11th, also in September and October. The last Fair for the year will be December 8th. I will also be selling hand-crafted Astrological Jewelry there. The summer sale has ended. We have moved ahead into Virgo season and not far behind is Autumn….Things will be changing, but our Astrological reports and Tarot card readings are still a great value!! I HAVE BEEN CASTING ASTROLOGICAL CHARTS FOR OVER 35 YEARS. I HAVE BEEN READING TAROT CARDS FOR OVER 15 YEARS AND CAN EVEN READ FOR YOU AT A DISTANCE BY PHONE, FACE TIME OR SKYPE. I am excited to add a new deck to my Tarot Card collection, “The Cat’s Eye Tarot”. These were created by a female Veterinarian and are very beautiful! I am getting familiar with them and will soon be doing Tarot Card readings incorporating these with my other favorite decks. It seems that readings can be done at a distance just as well as in person. So, if you have a question or need advice, I would be happy to work with you! Look above at my services on the menu bar. Here is a sample of these beautiful colorful cards. 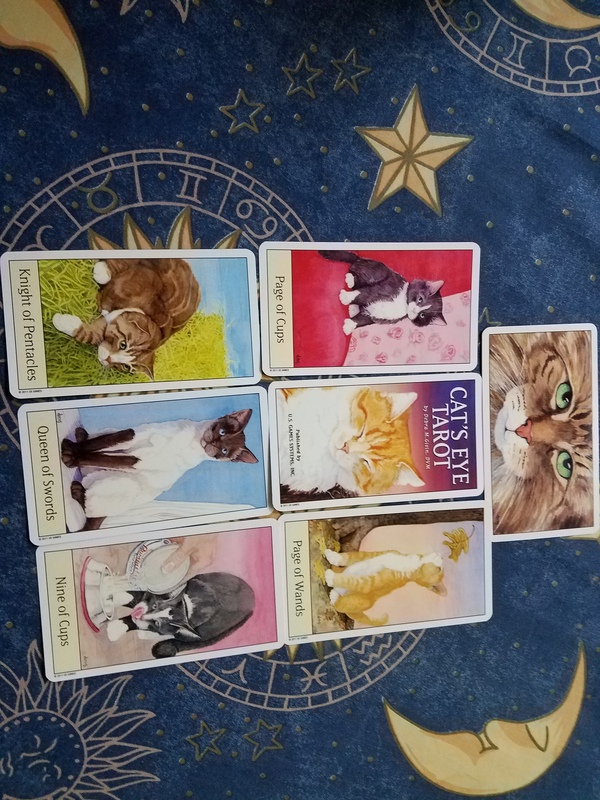 After designing my own deck of Astrology cards, I can appreciate all the work that went into these cards and I love cats too! It seems that everybody wants to find love. This is the most asked question in readings, followed by career questions! You can use The Astrology Game of Cards to find a love match. Play with 2 to 4 players. Deal out all the cards to the players. Each player looks through their cards and must begin by pulling out their Sun sign, as many of this sign as you have. Lay them on the table. Next each player should consult the enclosed Elements Card to see if their Sun sign is in the Fire, Air, Earth or Water group. Notice the other two signs sharing your group. Look through your cards and pull out all of those signs in your Element and lay them on the table. Notice that you are in harmony with those other 2 signs whether or not you have any in your hand. Cancerians share qualities with the Scorpios and Pisces, all being sensitive water ‘feeling’ signs. Gemini shares the Air sign group with Libra and Aquarius. All are intellectually inclined and enjoy a stimulating conversation. Taurus shares the Earth sign group with Virgo and Capricorn, all being practical and down to earth signs who take care of the business of life. Aries share qualities with the Leos and Sagittarians, all being action-oriented fire signs who don’t hesitate to get out there and get things started. To find more love matches, you need to know your Rising Sign, also known as the Ascendant. Look across the chart wheel and find the sign on the cusp or beginning of the 7th house, That is your partnership or marriage house and there is a strong attraction to others with that sun sign or Rising Sign. If you are a Leo Rising, ruling your personal house, then you will be attracted to Aquarians, the sign across the zodiac for a potential partner. If you have a Capricorn Rising sign, you will be very attracted to Cancerians, the sign across the zodiac wheel. Look at the sign where your Venus is. That symbol is the little circle with the cross under it. The sign listed with it is your love sign, so you can easily fall in love with someone having that Sun sign or Rising Sign. For Example Venus in Virgo feels romance with the Virgo Sun Signs or Rising Signs. You can get a chart wheel done for just $6.00 if you order the Astrology cards and want to add this love match game to all the other great games you can play with these unique cards. I will need your date, time and city of birth and $20 + $6.00 payable through Paypal or money order. For a full chart analysis, please check my pricing schedule from the menu bar above. You can learn a lot about your good love match while you play a game. Everyone counts up how many cards they laid down to see the winner of the game. Play it again and again with all your friends!! Love is always in the air!